Words can't describe what you're going to see when you play this clip! For $35,000 people do whatever they can to kill lions, but is it worth it? 15-20 years from now, do we want to see wild animals in the extinct list? These guys deserved what was coming to them… in full speed. I think you have to be very careful about what you can still believe today. We live in a profoundly diseased, self-complacent and selfish society that is seeking for recognition and not for knowledge. That means we are confronted more and more not only with fake news but also with many fake people - respect, honesty, compassion, humanity and reality have only become words. Very deplorable!!! I didn't check to see if it was fake or real. 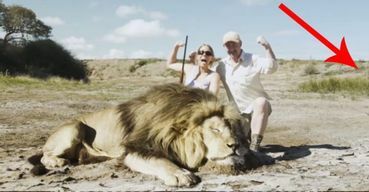 Ironically if it was real why didn't the 'brave' trophy hunter shoot instead of running away? I almost wished it wasn't fake.